Tara Vaughan's soulful vocals and piano techniques are reminiscent of a bygone era, but still have a unique and modern sensibility. In her vocal style you can hear the echoes and influence of legends like Patsy Cline and Sam Cook, and in her piano style those of rock icons like Carole King and Elton John. She Rocks celebrates women artists and songwriters of the 1960's-1980's, woven together with songs and stories. Backed by an all-star band, Vaughan performs music from artists like Janis Joplin, Linda Ronstadt, Aretha Franklin, Blondie, Heart, and many more. In this unique review, Tara Vaughan masterfully presents an evening of classic rock and roll with the focus on female artists and songwriters. Vaughan graduated from Tufts University and independently released three albums, the most recent of which, Dandelion Wine, was nominated for several Omaha Entertainment and Arts Awards. 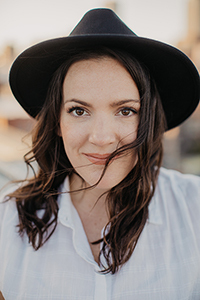 Tara's extensive touring history has lead her to open for such artist as Lifehouse, Ben Kweller, James McCartney, and most recently, internationally with Billy McGuigan.